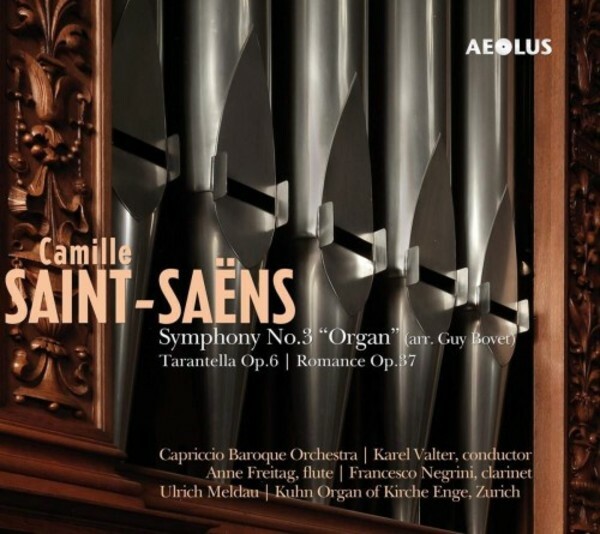 The Swiss composer Guy Bovet has created a chamber version of Camille Saint-Saëns’ popular ‘Organ Symphony’, which increases the significance of the organ part to a true ‘Symphony concertante’ for organ and orchestra. The result is convincing and the Capriccio Baroque Orchestra presents the work for the first time on historical instruments from the time it was composed. Capriccio was founded in 1999 by its artistic director Dominik Kiefer and soon became one of the most renowned baroque orchestras in Switzerland. Capriccio draws from a rich repertoire of works ranging from chamber music to symphonic music. In addition to the masterpieces of the great Italian, German and French composers or a cycle of the entire Beethoven symphonies, the orchestra focusses with a special devotion on newly discovered or rarely played works, which is reflected in an extensive and internationally appreciated discography.